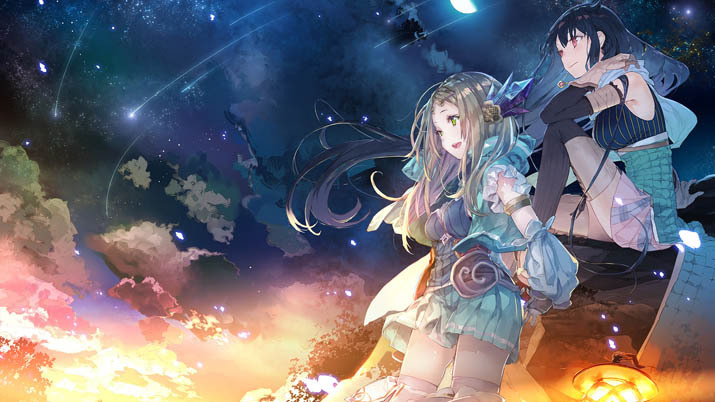 Atelier Firis: The Alchemist and the Mysterious Journey is a sequel to Atelier Sophie: The Alchemist of the Mysterious Book. At its core, Atelier Firis is a JRPG which emphasizes exploration and an alchemy crafting system, much like its sister title Atelier Sophie. 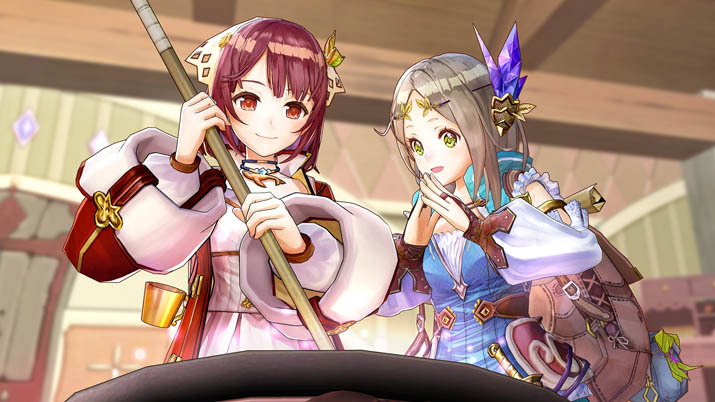 The difference comes in the protagonists: unlike the eponymous Sophie, we first see the titular Firis as she is praised by an elder for her gathering skills and knowledge of where to find ore; someone even tells her that she's amazing. This is a stark contrast from Sophie, who, despite her willingness, had no talent in the art of alchemy. Even so, Firis shows modesty and humility, as when she plays down her genius, stating, "I'm not THAT great..."
You begin in some cavernous area, where you can gather ore. In the previous entry, you start in Sophie's house, or atelier, then eventually makes your way to the first field. Here, the player begins in medias res, and while being familiar with Atelier Sophie is helpful, it is not strictly necessary. There is a light tutorial, especially compared to Sophie's more in-depth tour of the atelier; Atelier Firis seems to assume that the player has played its prequel. The so-called field turns out to be the starting town, Ertona. The township is enclosed, so one cannot see the sky, evoking dreariness. I get why Firis dreams of being under a cerulean sky. Beyond these skyward aspirations though, the story is not as rich or deep as that of its predecessor. Atelier Sophie had a more readily relatable protagonist, an airhead who blew up a doors first and asked questions later. Sophie has grown in alchemical prowess. But the erstwhile airhead Sophie has grown in alchemical prowess, and while not a fully-licensed alchemist just yet, she is well on her way. For example, she erects a tent that appears small on the outside, but is quite spacious; clearly her skills have advanced, no doubt with the assistance of Plachta. Firis tries her hand at alchemy, after Sophie and Plachta suggest she should, and she successfully makes something; Plachta recalls when Sophie was not able to make anything at first. 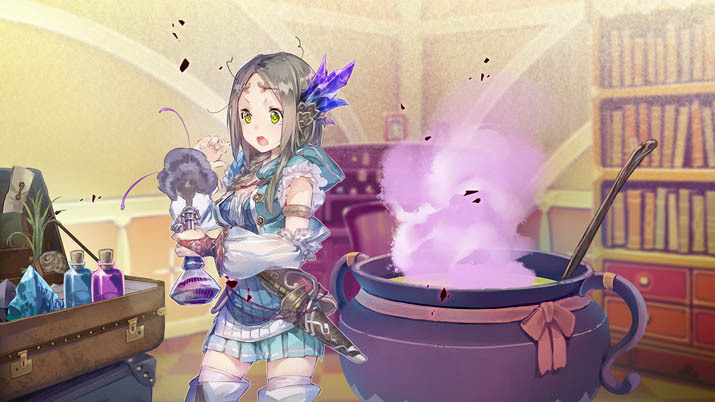 At one point, Plachta suggests she has more faith in Firis' budding skills than in Sophie's, saying that if Sophie were careless, Firis could surpass her in alchemy. The elder to whom Firis reports—she helps mine for the town—can convince Firis' parents to let her leave, see what is outside, and be under the big, blue sky—Firis' goal and dream. Originally, she is allowed to leave after helping the people in the town, but her mother has conditions, prompting the requirement that she pass the license exam, proving that she can be independent. If Firis can achieve this goal in a timely manner, she can leave the town, else she must give up her dream. This is when Firis is permitted to venture outside, and when Atelier Firis presents a sort of post-prologue song and credits. The musical number does not have quite the same effect as the one in Sophie, but it nevertheless informs the player: now your true journey has begun. It is also at this moment when Sophie and Plachta take their bittersweet leave, but Firis will see them again. The license exam seems a compromise between Atelier Sophie, where you have free reign over how you spend time, and previous Atelier titles where the game centered around timed missions. It is a compromise between those who lament over having everything timed, and those who lament over Atelier Shallie and Sophie, where having main missions timed was non-existent. For presumably, after you pass the exam, you are free to play without any time restrictions. Time in Firis goes by quick: the first ten days are rapid, continuously keeping the player focused. Every action, running around, gathering materials, and synthesizing eats away at the time you have left: some of the starting items to produce can take twelve-to-twenty hours. I advise keeping two saves, with this backup not too close to a deadline in case you misschedule, and updated after milestones, such as receiving a letter of recommendation for the license exam. Any extra time does not carry over as a reward: when you complete the first assignment before you can leave the town (the deadline of which is less than a month), the calendar fast forwards to the end of the month, as if you had spent that time. Don't fret over the first assignment, as there should be over ten days left—that said, focus is key, and this discipline will help ensure that you pass the license exam, which has a deadline of just under a year. Checking the information of a quest in the quest book and also the location of a quest on the map will prove helpful. They often tell you where to go, with whom to talk, or what to do or make; not all quests will appear on the map, such as the one in Faave Hills, where you must look for a cow that has escaped. You might quickly find that this long-term deadline is hard to plan for, compared to several assignments that each have a deadline of a month. Several smaller missions with shorter deadlines would let the player know that he is on the right track; with a year deadline, it is difficult to know if you are using the remaining time efficiently. Or, as previous Atelier titles have shown, this deadline may be lenient and any stress is unfounded in retrospect, provided that the player is continuously working toward the main goal, not attempting to do everything, and certainly not slacking in the mission. Alchemists who offer to write a letter for you give you assignments to test your abilities, but these missions have no deadlines. Completing the initial tasks sometimes prompts an additional task that assists both the licensed alchemist and the town as a whole. The title rewards exploring, and that is how you will find the proper materials to aid you. I spent a large chunk of time searching for new materials, synthesizing, and practicing alchemy to unlock new recipes that may come in handy later. Since my alchemy level was already high enough to construct what was required for my first letter of recommendation, I did not need to spend any extra time leveling up. Reaching this first alchemist and getting the letter took about a month, but this involved focusing on the main task, and completing side missions only whenever it seemed necessary. One side quest—Beast of the Prairie—was broken, as it didn't progress when I fulfilled its conditions. When I returned to its lair the next day, it had respawned, as if I hadn't killed it. Am I supposed to kill it right in its lair? It chased me to the outskirts before I decided to fight it, but figured this would have been fine, given that I completed the side quest Divide Food Equally outside of the town proper, but still within the confines of Faave Hills. I'll return to the quest later, and hope it's fixed. Atelier Firis overhauls both the way in which one explores the world and the synthesis system. Unlike the previous release, you do not unlock maps, and the maps are not small; rather, the starting map is large in comparison to Atelier Sophie, and branches off into other parts of the world. The size of the maps sets these two games apart, and the maps in Atelier Firis all feel unique. Each time you access a new part of the world, you get the impression that there is something new to uncover. The mini-map no longer shows gathering points; nor is a map of the area filled until you explore those sections. Marking spots and having an already filled out map may diminish the incentive to explore, as players would know in an instant to where they should head. Synthesizing now shows lines that you must fill with an ingredient to activate a bonus, compared to Atelier Sophie, where it played as a mini-puzzle (and here it seems less puzzle-like) and you had to plan to make the pieces fit to bolster the effects of the item. However, to lessen monotony, catalysts can be used to change the bonus lines and the effect that filling a line produces. The developers also set up the recipe menu differently: instead of recipes being divided into various sections to unlock, they now appear on one page with more recipes to learn appearing as you progress in the story, based on what quests you complete. The recipes are not set up like a skill tree, where you could see the progression of recipes to learn and have some milestone that progresses the story. The overhaul makes the game itself linear, as you must focus on the main quest, as opposed to being given free reign over how to spend your time and venture. The recipe-learning system itself though seems more non-linear, since new items to produce in the cauldron are unlocked depending on which quest you complete, not in any specific order. The battle system between the two titles is largely unchanged, save for that there are no longer defensive and offensive stances; instead, you can use a portion of the bonus gauge to have Liane (Firis' sister) or a travel companion guard Firis and take damage on her behalf. Her stats are considerably low compared to Liane's, even when almost the same level. Characters level faster in Firis than in Sophie, so the level cap may be higher to help accommodate for this; after approximately six hours in Firis, my Firis was level ten – compare that to a Sophie level of nine, after eight hours. The bonus gauge also activates a combo when full and when you meet certain conditions. An added feature is the Observation Institute found in various cities, which Firis can visit and wherein she can deliver the knowledge she has discovered regarding various aspects of the world: from items, to recipes, to how much of each area you have uncovered. In return for this information, the Institute offers items and Cole (money). Side missions can also quickly increase your wealth, but not all offer Cole. The quest book shows what reward(s) a quest offers. At the desk in the atelier, you can select which songs will play, and you can even choose the theme from Atelier Sophie; later on, you can customize the atelier, and certain items placed as decor will grant a bonus to aid Firis on her travels. The camera movement quickly zooms in and out when moving up or down the stairs, and modifying the camera speed in the settings does not change this. The zoom is also affected by the surrounding scenery or structures, so if you rotate the camera to a location where Firis is obstructed from view, the camera will zoom so that scenery does not impair the field of vision. While I see why this is useful, the speed at which the camera does this—particularly on stairs—may become a nuisance, but it is not overwhelming (I am prone to minor motion sickness if the camera is too quick). There is no option to manually control the camera's zoom. Another issue is in the graphics, as, randomly, some parts of the scenery will have an odd grid or striped shading – but this is seldom. The Atelier series may not appeal to players who prefer nearly non-stop action and combat; but if you enjoyed previous Atelier titles, there is a high chance you will come to relish Atelier Firis. The drive for pushing through the story slowly builds, whereas, in Sophie, you may feel a sense of unwavering dedication and determination from the start. Firis takes a couple of hours or so to get the motivation to see this mission through; I wasn't sold until after I earned my first recommendation, but once you reach this point, it's likely you won't be able to put down this game, at least not for long. You must see the journey to its end; you must finish out the mission and help Firis become a licensed alchemist. Even if the story or the protagonist is not initially as captivating, Atelier Firis complements Atelier Sophie well and is a great addition and continuation to that game, and the Atelier series at large. I can't wait to see what's next in the Atelier lineup.